For the determination of vapor pressures (T, Ps data) of pure components or defined mixtures set-ups with different designs (static or dynamic) and measurement ranges are available. Ranges are approximate values and may vary for different combinations of cell material and systems to measure. Vapor pressures can be measured by means of a dynamic method with an ebulliometer like the small glass ebulliometer (similar to the Scott ebulliometer, see following figure). With this equipment, vapor pressures of pure components can be experimentally determined in a temperature range from approx. 250 to 620 K and at pressures from about 2 mbar up to 1 bar. At a given pressure (regulated by an electronic pressure control), the boiling temperatures of a component are measured. Due to the volume of the equipment only small amounts of the substances (about 20 ml) are needed. With the small glass ebulliometer (or with our Scott ebulliometer) also isoplethic vapor-liquid equilibrium measurements can be performed. Low vapor pressures of liquids and solids can be measured by means of the gas saturation method (see following figure). With this equipment, vapor pressure data of pure components can be experimentally determined in a temperature range from approx. 280 to 620 K and at pressures from about 0.01 mbar up to 10 mbar. 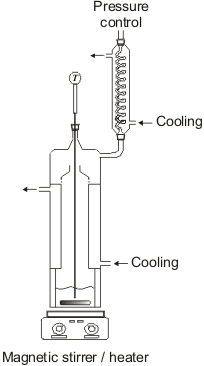 A preheated inert gas flow (e.g. 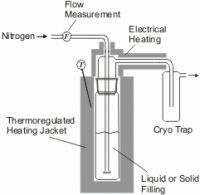 nitrogen) is saturated with the liquid or solid substance in a thermostatted glass cell, so that the substance is stripped out of the cell and can be frozen in a cryo trap. 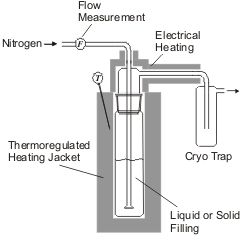 Since flow and temperature conditions in the cell are monitored with a computer during the whole measurement procedure, the total amount of nitrogen can be determined. From these data and from the amount of substance transferred into the cryo trap or the loss of substance in the cell, respectively, the vapor pressure can be calculated.